Singapore has triumphed over big guns like London and New York to top a global ranking of smart cities in 2017. The ranking lists the top 20 cities in terms of the integration of Internet of Things (IoT) technology and connected services across the key areas of mobility, health, public safety and productivity. Singapore not only ranked as the top "smart city" but also came out tops in all these areas. The study noted that Singapore's Smart Nation initiative and its position as a city-state make the country unique in its ability to execute its smart-city vision. It found that the use of IoT-enabled infrastructure here, such as applied smart traffic solutions used by the Land Transport Authority, may save drivers up to 60 hours a year. 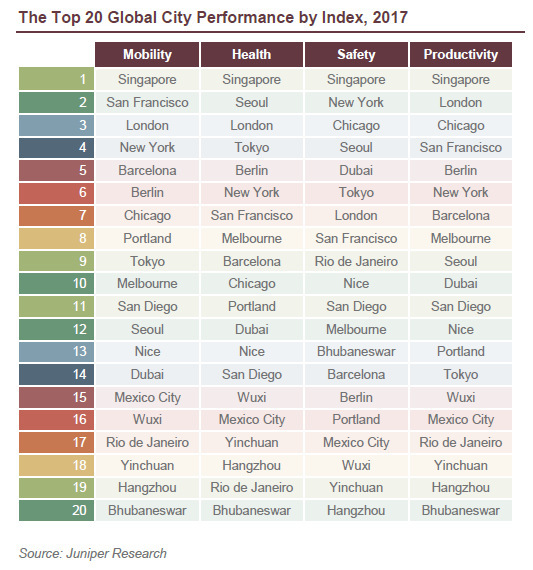 San Francisco and London were ranked second and third, respectively, in this area for their efforts to use technology solutions to curb mobility-related issues such as traffic congestion. In healthcare, the study found that smart cities with connected digital health services, such as wearable apps that monitor blood pressure, can save individuals close to 10 hours a year. "Singapore and Seoul were notable in terms of their focus on addressing healthcare service provision for elderly citizens through a range of technologies, including digital service platforms as well as remote monitoring devices," said market researcher Juniper Research, which carried out the survey with help from Intel. Mr Windsor Holden, Juniper Research's head of forecasting and consultancy, said: "We can't overlook the importance of the real human benefits that smart cities have. Connected communities, municipal services and processes have a powerful impact on a citizen's quality of life." Improvements in public safety through the use of IoT technologies may result in time saved for city dwellers, according to the study. Juniper said that implementing such technology, like Singapore's trial and use of smart video surveillance, can result in time benefits of nearly 35 hours a year for citizens. Encouraging digital innovation to address urban planning challenges and the ability of citizens to access digital services and city information were deemed critical in improving productivity. Singapore, London and Chicago were found to be leaders in this area, each with large open data stores alongside strategies to encourage private innovation, Juniper noted. Mr Sameer Sharma, Intel's global general manager of Smart Cities IoT solutions, noted: "Cities are engines of economic activity, and we as an industry need to make them more resilient and responsive."